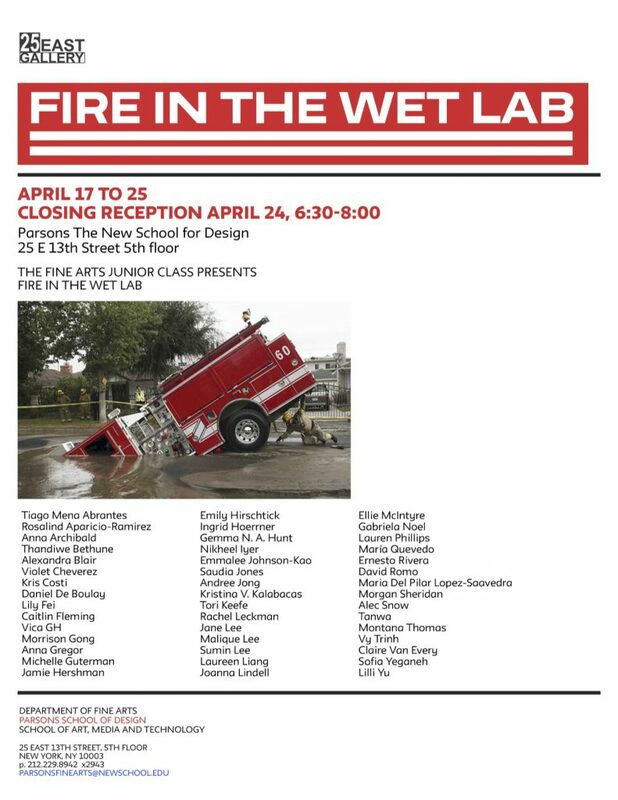 The Junior Class of the Parsons Fine Arts program is pleased to announce Fire in the Wet Lab, a group exhibition featuring recent work by the cohort’s 48 students. Having experienced a number of collective setbacks due to recent events, the featured artists choose to reclaim the limiting conditions under which the work is made. As the title Fire in the Wet Lab indicates, the featured work embraces opposition. From using a preservative to intentionally undermine material qualities to presenting a QR code to access a more traditional oil painting, artists pose contradicting elements in dialogue with one another. Even within specific themes, artists explore the dualities of ideas at play, some contrasting artificial representation with natural sounds, or presenting the extravagance of an event alongside the quiet of its aftermath. Just as the exhibition is the result of challenging circumstances, much of the artwork exists as a fragment, trace, or embodied memory of moments past. As these objects represent the times and spaces in which they were created, they express the fluidity of a moment in flux, or a problem unresolved. As 48 artists attempt to adhere to the spatial demands of the exhibition space, they find themselves continually getting in each other’s and their own way. Rather than force unnatural resolution, the artists take advantage of the dynamic nature of unfinished business.